Meanwhile at SIFMA's regulatory conference, the Wall Street lobby released a study challenging the White House's claim that conflicted advice costs investors $17 billion annually. 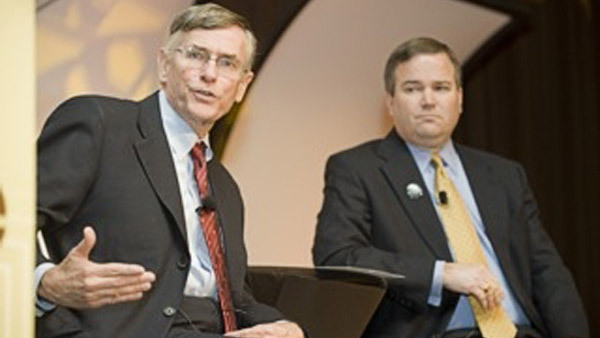 Ketchum (left, with FSI's Dale Brown) told ThinkAdvisor that White is the "right person to lead us" to a best-interest standard. It’s time for the Securities and Exchange Commission to move on a “best-interest” fiduciary standard, and despite split views at the Commission on such a rule, SEC Chairwoman Mary Jo White can move it forward, Richard Ketchum, chairman and CEO of the Financial Industry Regulatory Authority, said Monday. It “would be far preferable to have a single, consistent [fiduciary] standard that operates out of the SEC across all [investment] vehicles that exist for the individual investor,” Ketchum said Monday morning during a question-and-answer session with Ira Hammerman, the Securities Industry and Financial Markets Association’s executive vice president and general counsel, at SIFMA’s Compliance and Legal Seminar in Phoenix. Ketchum said during the Q&A that “if there’s an impression in America that undisclosed backdoor payments are the driver of what goes on in the securities industry, that impression is false. Those payments would be illegal.” He was referring to comments made by President Barack Obama in a Feb. 23 speech at AARP endorsing the Department of Labor’s redraft of its rule to amend the definition of fiduciary under the Employee Retirement Income Security Act. Any best interest standard, he continued, has to recognize that “significant change” needs to occur regarding disclosure and fees, and that that information should come “up front,” suggesting that BDs should have to disclose such information to clients in a format similar to the Form ADV that advisors give to their clients. White is set to speak Tuesday at the SIFMA event in a Q&A with SIFMA president and CEO Ken Bentsen. Hammerman told Ketchum it would be a “good idea” for FINRA to enter the fiduciary debate by sending a comment letter to DOL. “We certainly would like to be part of the discussion,” Ketchum responded. Ketchum told ThinkAdvisor that “we’re more than willing to be in a dialogue with the SEC and, for that matter, the Labor Department” on a fiduciary rulemaking. “We really care about moving to the best interest standard [and] we will be responsive to anything the SEC thinks we should move forward on” in this regard. The NERA report also states that the administration ignores the negative consequences of similar retirement regulations in the U.K., noting that “a sizeable number of low-balance clients lost their advisor. [Consultancy] Europe Economics finds that just in the first three months of 2014, about 310,000 clients stopped being served by their brokers because their wealth was too small for the broker to advise profitably.” An additional 60,000 investors were not accepted as new clients by brokers for the same reason over the same three months, NERA says. Lisa Bleier, SIFMA’s managing director, Public Policy and Advocacy, noted on a call with reporters that DOL sent its fiduciary redraft to the Office of Management and Budget on Feb. 23 and that the redraft “probably won’t be there for the full 90-day” review period. The measure will likely be proposed by DOL in spring or early summer, she predicted. Bensten noted on the call the “strong bipartisan opposition” to the prior rule issued by DOL in 2010, stating that he believes “there is still a bipartisan” opposition to the direction DOL will take with its new plan.